This is the first in a series of quasi-weekly pieces leading up to the beginning of the college football season where I analyze the SDPI of the two teams that played for the mythical national title in the days before the BCS (plus other contenders if there was controversy). Don't know what SDPI is? Click here for an answer. We'll begin with the 1995 season. The de facto national title game was played in the Fiesta Bowl between Nebraska and Florida. Come take a trip with me back to a simpler time; when games could end in ties, when Tom Osborne was patrolling the sidelines in Lincoln, and the Ol' Ball Coach was turning a weak-armed, balding quarterback into a Heisman Trophy candidate. To say Nebraska dominated the Big 8 in 1995 would be an understatement. They beat every conference opponent by at least 23 points. They pitched two shutouts (Oklahoma and Missouri) and another team netted only a field goal (Kansas). They scored at least 37 points in every conference game and broke the 50-point barrier three times. Their offensive SDPI alone (2.01) would have won the league and their defensive SDPI (1.53) would have finished a close second. Still, the Big 8 was far from a one-team league in 1995. Kansas State, Colorado, and Kansas all finished the season ranked in the top-10. The Jayhawks' ranking was undeserved, with a non-conference slate that included Cincinnati (6-5), North Texas (2-9), TCU (6-5), and Houston (2-9) coupled with a combined drubbing of 82-10 at the hands of Nebraska and their arch-rivals in Manhattan, but Kansas State and Colorado were legitimate top-10 squads. The Big 8's four bowl teams won their bowl games by a combined score of 205-81 for an average margin of victory of 31 points, with no margin being less than 21. Much like the Cornhuskers, Florida dominated their league in 1995. The Auburn Tigers hung within 11 points of the Gators, but that was the closest an SEC team came to knocking them off. The Gators were held below 30 points only twice (they scored 28 in back-to-back weeks against Mississippi and LSU). Over in the SEC West, it appears only the fourth best team in the division took the crown. The Hogs parlayed a 4-0 record in close conference games and a schedule devoid of Florida (Auburn and LSU faced the Gators) into an SEC Championship Game appearance. The Championship Game was fairly boaring as the Gators humbled the Hogs 34-3. Tennessee was the only other SEC school to finish in the top-10. Somehow they finished #2 in the polls despite losing to the Gators by 25 points. Florida's dominance, while still pronounced, was a notch below Nebraska's. The Cornhuskers entered the game as a slight favorite over the Gators (most odds makers had them around three points). The Gators opened the game with a field goal and led 10-6 after the first quarter. That's when the onslaught began. Nebraska scored 29 points in the second quarter; two field goals, a safety, and three touchdowns if you're scoring at home. Incidentally, none of those touchdowns was scored by Tommie Frazier. He scored twice in the third though, one of which was the infamous 75-yard run where he looked to be toying with the defense. The vaunted Gator offense managed only two touchdowns all game. Their third touchdown came courtesy of a Reidel Anthony kickoff return late in the fourth quarter. All told, the Huskers rushed for 524 yards (199 by Frazier), sacked Florida quarterback Danny Wuerffel seven times, and picked off three passes in a 62-24 win. The four components are winning percentage for the previous three seasons; with each season decreasing in importance as the distance from the current season increases and the final component is a winning percentage of .500 as teams tend to trend towards .500. Including this component ensures we don’t penalize coaches coming off undefeated seasons because improving upon a 100% winning percentage is impossible. Additionally, we don’t reward coaches who go winless because we assume they will improve at least marginally. Next we just subtract the team’s expected winning percentage from their actual winning percentage. This number is the coach’s rating. In 2003 the Bears went 8-6 (.571 win %), in 2004 the Bears went 10-2 (.833 win %), in 2005 the Bears went 8-4 (.667 win %), and in 2006 the Bears went 10-3 (.769 win %). The 2003 win % gets multiplied by .5. The 2004 win % gets multiplied by .2. The 2005 win % gets multiplied by .1. Then we multiply the standard .500 win % by .2. (.667*.5)+(.833*.2)+(.571*.1)+(.500*.2)=.657 is Cal's expected win % for 2006. Cal actually won at a .769 clip so Tedford's coaching rating for 2006 is +.112 (.769-.657). This means Cal won a little more than 11% more games than was reasonably expected at the beginning of the season. This figure was the fourth best coach rating in the Pac 10 in 2006. Before we get into the coaching rating portion, it’s important to find out if this expected winning percentage is at least a decent predictor of a team’s record. If it’s not then the coach rating is not a valid statistic. Fortunately it is quite valid. The r squared value for the expected winning percentage predictive power in 2006 was .3437. This means that expected winning percentage explained a little more than 34% of the variation in actual 2006 winning percentage. If we break this number down by BCS and non-BCS schools we find that it is a much better predictor for a BCS school’s record than for a non-BCS school. The r squared value for BCS schools (including Notre Dame) was .4254 in 2006. For non-BCS schools it was only .1705. This is still a decent relationship, but it shows that the records of non-BCS schools tends to vary more from year to year than the records of BCS schools. Consequently, we should not be quite as shocked when non-BCS schools see a substantial jump in their winning percentage. BCS schools live in a more caste-dominated society where the divisions between upper, middle, and lower classes are rigid and defined. Non-BCS schools on the other hand reside in a more socially unpredictable society where the lines between the three classes are much less defined. With that out of the way, here are the best coaches from 2006. At worst, this rating seems to be a solid predictor of coach of the year award winners. 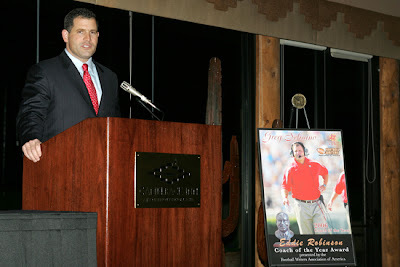 Petersen won the Paul 'Bear' Bryant Coach of the Year Award, Jim Grobe won the Bobby Dodd Coach of the Year Award, and Greg Schiano won the Walter Camp, Eddie Robinson, and Home Depot Coach of the Year Awards. Now here are the worst coaches from 2006. Three of these gentlemen were axed after the season (Amato, Bicknell, and Harris) and several others are on the hot seat heading into 2007 (Genyk and Montgomery). Of course, some are also good coaches who just had poor seasons (Amstutz, Hill, Hawkins, and West). Now here are the best coaches by conference. And finally the worst coaches by conference. Obviously this system is not meant t0 be the end-all, be-all of coaching ratings. I don't think Rich Brooks is a better coach than Steve Spurrier, but in accordance with exceeding preseason expectations, Brooks was better in 2006. When I blog about teams, I talk to a great extent about how luck and random chance are a significant determinant to which team wins a college football game. A lot of those factors that equate to luck are random chance are not easily measured, a guard missing a block that leads to a stuff on fourth and goal, a hold that wasn't called, a gunner out of position on a kickoff that leads to a great return to name a few, but there is one facet of luck that can easily be measured--fluck or fumble luck. When a team fumbles the football, one team recovers it and one team does not. The result of the fumble has a zero-sum outcome. One team is very happy (or relieved if they were also the team that fumbled) and the other is disappointed. On average, a team will recover half of the combined fumbles it causes and its opponents cause. Of course, fumble recoveries are not evenly divided amongst teams. Some teams recover a high percentage and others recover a low percentage. It stands to reason that fumble recoveries can play a crucial role in who wins and who loses. Well, let's find out. Using the great website, CFBstats.com, I took each college football teams fumble recovery percentage and compared it with their winning percentage to see if fumble recovery percentage was a good predictor of winning percentage. CFBstats has data from 2004-2006, so there are 353 team seasons, in my opinion, a significant sample size. The r squared value, for an explanation of r squared click here, for fumble recovery percentage and winning percentage is almost nonexistent. The value is .002. This means that less than one percent of the variation in a team's winning percentage is explained by that team's fumble recovery percentage. Well that settles it then. Fumble recoveries have almost no correlation whatsoever to winning percentage. Hence they are not important. That doesn't make much sense does it? Of course fumble recoveries play a role in winning and losing. How else can we examine and prove this phenomenon is true? Let's look at the 'best' and 'worst' fumble recoverers (top 10 and bottom 10) in 2004 and 2005 and see how they performed the next season, both in recovering fumbles and in winning percentage. I use quotation marks because recovering fumbles is not a skill, so luckiest and unluckiest are probably more apropos terms. Combined, these 10 teams recovered 65.4% of fumbles and had a record of 73-45 (.619 winning percentage). Here's what happened in 2005. I lack any HTML skills to create tables in blogger, so the values have been color coded. Values in red indicate a decline from the previous season and values in black indicate an improvement. In 2005, the top 10 fumble recoverers from 2004 combined to recover 52% of fumbles (down from 65.4% in 2004) and saw their record decline from 73-45 (.619) to 61-55 (.526). Only two of the teams recovered a higher percentage of fumbles in 2005 than they did in 2004 (Texas Tech and Florida) and while four teams did improve their record in 2005 (Texas Tech, Stanford, Northwestern, and Florida), three of them improved by only one game. Conversely three teams declined by at least three games (and one by two and a half). Now the other side of the coin, the worst fumble recoverers from 2004. Combined, these 10 teams recovered 34.7% of fumbles and had a record of 53-61 (.465 winning percentage). Here's what happened in 2005. Once again the values are color coded. Green means the value stayed the same. The bottom 10 fumble recoverers from 2004 saw their fumble recovery rate improve to 47.9% in 2005 (from 34.7%) and their cumulative record improved from 53-61 (.465) to 60-56 (.517). Every team saw their fumble recovery rate improve and half the teams saw their record improve. Four of the five teams that improved (Ohio State, UCLA, Kansas, and Baylor) saw their record jump by at least two games and the other team (NC State) improved by a game and a half. UNLV and Georgia Tech had the same record both seasons. Combined, these 10 teams recovered 65.6% of fumbles and had a record of 86-35 (.711 winning percentage). Here's what happened in 2006. In their follow up campaigns, these 10 teams combined to recover 48.2% of fumbles (down from 65.6%) and saw their record decline from 86-35 (.711) to 84-46 (.646). Every team saw their fumble rate decline. Four teams did improve their record (Florida, Southern Miss, Wisconsin, and Mississippi), and of those four, all but Mississippi improved significantly (at least one game). Five teams declined by at least one game with three declining by at least two games (Texas, Colorado State, and Louisiana Tech). Combined, these 10 teams recovered 33.8% of fumbles and had a record of 52-63 (.452 winning percentage). Here's what happened in 2006. The bottom 10 fumble recoverers from 2005 saw their fumble recovery rate improve to 49.8% in 2006 (from 33.8%) and their cumulative record improved from 52-63 (.452) to 61-62 (.496). Every team saw their fumble recovery rate improve and six teams saw their record improve. Every team that improved (Wyoming, ECU, Auburn, Arizona, Tulane, and New Mexico State) improved by at least one game. LSU had the same record both seasons. While fumble recovery rate in itself does not determine a team's fortunes, a good rate can help mediocre teams have good seasons (Louisiana Tech in 2005) and very good teams have great seasons (Utah and Oklahoma in 2004 and Texas in 2005). Conversely, a poor rate can cause mediocre teams to have poor seasons (Wyoming in 2005) and bad teams to go winless (New Mexico State in 2005). It is an important fact to know about a team, but needs to be used in conjunction with many other factors when attempting to predict a team's future success. With that in mind, here are the best and worst fumble recoverers from this past season. If the past two seasons are any indicator between five and six of teams should see their record decline in 2007. My guesses are Michigan (hard to top 11-2 even if they are the best team in the Big 10), UAB (new coach and killer road schedule--Michigan State, Florida State, Tulsa, Mississippi State, and ECU are the highlights), Mississippi (play in the SEC West), Northern Illinois (lose Garrett Wolfe and return one quarterback with experience, Dan Nicholson, who didn't exactly set the world aflame when he had a mega-threat in the backfield with him), and Rice (new coach, 5-1 record in close games in 2006, perennial loser). That's actually 11 teams (New Mexico State and Wake Forest tied for 10th worst). If the past two seasons are any indicator, about five or six of these teams should improve in 2007. My guesses are Stanford (hard to get any worse), UNLV (1-3 in close games in 2006), Nebraska (Sam Keller coming in to run Bill Callahan's system), South Florida (two words--Matt Grothe), UCF (George O'Leary hasn't forgotten how to coach and a 2-3 record in close games in 2006), and New Mexico State (0-4 in close games in 2006 and Chase Holbrook returns to run Mumme's system). When Texas won the national championship in 2005, they dominated almost every team they played, save two--Ohio State in Columbus and Southern Cal in the Rose Bowl. They won those games by three points apiece. In both games, the Longhorns combined to fumble eight times, yet only lost two. The Buckeyes and Trojans combined to lay the ball on the ground four times, losing two of them. All told, there were 12 fumbles in those two games. The Longhorns recovered eight of them (66.7%). The Longhorns were one of the best teams in the nation in 2005 even without the football gods on their side. The difference between immortality and a fading memory is a few lucky bounces. A team's record in close games is a topic I have examined several times here at Statistically Speaking. Not to beat an old horse, but the off-season is very long, so here's another look. If you want a refresher on the other findings regarding close games, you can read about them here, here, here, and here. This post will examine how well six different team statistics correlate with a team's record in close games. The sample size for this test is every Division IA team that played at least three close games in 2006 (100 teams). The independent variable is always the team statistic that is being evaluated and the dependent variable is a team's winning percentage in close games. The first statistic we'll examine is turnover margin. Turnover margin can be positive or negative and is simply the number of turnovers a team commits subtracted from the number of turnovers it gains. It is calculated on a per game basis. I am using turnover margin instead of the more familiar (to NFL fans) plus minus ratio because college football teams do not play the same number of games. The best team in terms of turnover margin in 2006 was the Minnesota Golden Gophers. They played 13 games during which they lost 14 turnovers and gained 32. Their turnover margin was +1.38 per game. This means they averaged close to one and a half fewer turnovers per game than their opponents. The worst team in 2006 was the Army Black Knights. They played 12 games and committed 37 turnovers while gaining only 19 for a turnover margin of -1.50. Turnover margin has a positive relationship with a team's record in close games. This means that as a team's turnover margin improves, a team's record in close games should also improve. However, the relationship is very weak. The r squared value is only .0502 meaning that only about 5% of the variation in a team's record in close games is explained by their turnover margin. The weakness in this relationship is best illustrated by Minnesota. Despite leading the nation in turnover margin, they finished 1-3 in close games. 3rd down % is the percentage of times a team converts 3rd downs into first downs by picking up the necessary yardage. The NCAA leader in this category in 2006 was the Hawaii Warriors. They converted almost 58% of their 3rd downs into 1st downs (77 out of 133). The worst team at converting 3rd downs was Florida International. The winless Golden Panthers converted 23.5% of their 3rd downs into 1st downs (39 out of 166). 3rd down % also has a positive relationship with a team's record in close games. As a team improves it's conversion percentage it should see improvement in it's record in close games. However, this relationship is even weaker than the one for turnover margin. The r squared value of .025 is less than half that for turnover margin. The mirror image of 3rd down %; this is the percentage of times a team prevents their opponent from gaining the necessary yardage to move the sticks on third down. The best team at preventing their opponents from converting 3rd downs in 2006 was the Virginia Tech Hokies. Opponents converted only 27% of their 3rd downs into first downs (50 out of 185). The easiest team to convert 3rd downs on was the Air Force Falcons. Opponents converted over 56% of their 3rd downs into first downs (79 out of 141). The Falcons were the only team to allow a conversion rate greater than 50% in 2006. 3rd down % defense has a negative relationship with a team's record in close games. As a team allows a higher conversion rate, their record in close games should decline. Once again this relationship is also weak with an r squared value of only .0963. Clutch kickers should help a team pull out close games. Field goal % is simply the number of made field goal divided by the number of field goal attempts. The North Carolina Tar Heels made all ten of their field goal attempts in 2006. For teams with more than ten attempts, the Southern California Trojans made 16 of their 17 field goal attempts on the year (94.1%). The Kent State Golden Flashes had the worst accuracy, converting only two of their ten field goal attempts. For teams with more than ten attempts (barely), the Duke Blue Devils made four out of eleven (36.4%) to finish last. Field goal % has a positive relationship with a team's record in close games. This means as field goal percentage improves, a team's record in close games should also improve. However, this relationship is nearly non-existent. The r squared value is a paltry .009. How can something that seems so vital to a team's success in close games have no relationship? One need only look at the 2006 Florida Gators to devine an answer. The immediate thought that comes to mind when discussing field goal % and close games is that a team with a good kicker will win those games more often because of their kicker. What if they win those games more often in spite of their kicker. In 2006, Christ Hetland attempted all of Florida's 15 field goals. He made six of them (40%). In 2006, Florida played five close games and had a 5-0 record (discounting the Auburn game that was a ten point margin thanks to the games final play). In their one-point win over Tennessee, Hetland missed both his field goal attempts. In their seven-point win over Georgia, he was again 0 for 2. In their one-point win over South Carolina, he did manage to make one of his two attempts. In their seven-point win over Florida State he missed both his attempts. Even if he had made both against Tennessee, that game would have come down to the wire, but leaving points on the board against Georgia and Florida State made those games much closer than they should have been. Another make against South Carolina and it wouldn't have take a block party from Jarvis Moss and Ray McDonald to squeak out a win. Despite his best efforts, Chris Hetland failed to sabotage the Gators national title dreams. Scoring offense is simply the number of points scored divided by the number of games played. Hawaii led the nation in scoring in 2006, averaging 46.86 points per game. Once again Florida International brought up the rear averaging only 9.58 points per game. Scoring offense has a positive relationship with a team's record in close games. As a team scores more points, their record in close games should improve. Once again, the relationship is weak. The r squared value for the correlation is only .0479. Scoring defense is the number of points allowed divided by the number of games played. Virginia Tech allowed the fewest points per game in 2006 (11 per game). At the other end of the spectrum was Louisiana Tech. The Bulldogs allowed 41.7 points per game. Scoring defense has a negative correlation with a team's record in close games. As a team allows more points, their record in close games should decline. Th relationship is still relatively weak with an r squared value of .1214. None of the six team statistics examined here is highly adept at predicting a team's record in close games. This seems to be further proof that close games are nothing more than coin flips or crap shoots. However, something interesting does show up when you take a second look at the r squared values. Both defensive statistics have a much stronger correlation (although still relatively weak) than any other statistic, especially the offensive statistics. This seems to reiterate a finding I posted about a year ago that good defensive teams tend to win more than their fair share of close games. Just some examples off the top of my head are Ohio State in 2002 and my beloved Demon Deacons in 2006.